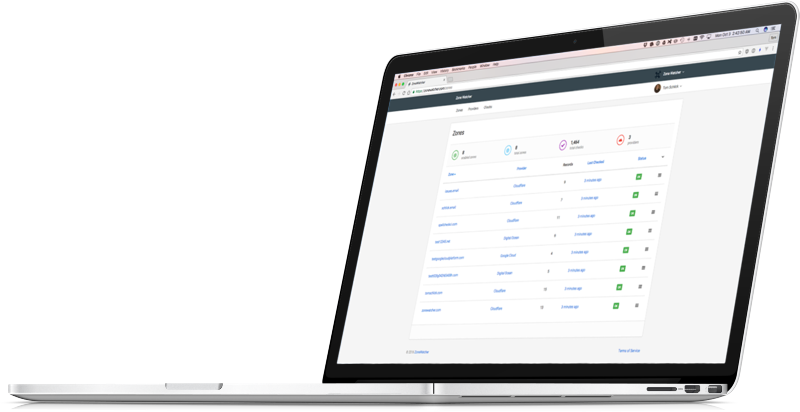 Keep track of DNS changes to any of your domains across all of your providers. If you manage domains, this is for you. Say goodbye to manually backing up prior to a DNS change. Automated checks ensure you always have a backup copy in case something goes wrong. Review a zone's entire history of changes in diff format. Monitor all of your clients' domains no matter which provider they use. Create a team for each entity you manage. Receive email alerts when anything changes. Your check data stays yours. Export your data as zone files at any time or use our REST API (coming soon) to interact with the data in your own applications! DNS providers we currently sync with. Simple pricing for any use case. Need a bigger plan? We can help! Please contact us. All of our payments are processed securely by Stripe. No raw payment information hits our servers to ensure security.